• 4 D-ring boot • Dual density PU • 200 Joule steel toe cap and midsole • Shock absorber heel • ..
• 4 'D' Ring Boot with Scuff Cap • Dual density PU • 200 Joule steel toe cap and midsole • Shock ..
Black leather mid cut boot Padded collar and tongue Reflective flash Steel toe cap and mid-..
Goliath Footwear Bristol ELSP1023 Black full grain leather ankle boot with padded collar. Upp..
EL170DDR Black safety chukka boot. Dual Density Rubber injected sole unit heat resistant to 300..
Upper Material: Super tough waxy buffalo leather. Lining: Moisture wicking lining throughout. ..
One of the most durable boots on the market, the Ebonite is constructed in partnership with FORCE.. Slate are safety boots with true character, finished in a full-grain waxy black le..
Appropriately named ‘Flint’, the rock-like qualities and extreme durability of these boots make t..
• Full grain leather/nubuck • Taibrelle textile lining with moisture wicking properties • Ortholit..
S1 Antistatic S3 Antistatic Water resistant Waterproof and Breathable Lining Steel mid..
S3 Antistatic Water resistant Waterproof and Breathable Lining Steel midsole Duel Dens..
Toe Protection. Heel energy absorption. Leather Upper. 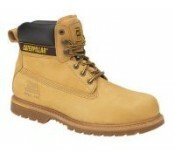 Air Cushioned PVC Sole. Unisex Siz..